It’s absolutely beautiful here today. Here’s my broadcast schedule for this weekend. It’s a crazy short weekend with everything scheduled so tightly and we’re all rushing from one thing to another here in the media center and garage. .
I’m on the air tonight (Friday April 17) for “Dialed In” LIVE from the media center at Phoenix from the end of Sprint Cup Qualifying (Qualifying begins at 7:00 p.m. EST) to the start of the Basha’s Supermarkets Nationwide race (coverage on MRN Radio heard on Sirius NASCAR Radio). Tomorrow – “Dialed In” will air from 2:00 EST to the start of the SIRIUS NASCAR Radio Pre Race Show at 4:46 p.m. EST at which time I will be in the booth and Steve Post in the garage for the pre race show. Following the Sprint Cup Series Race (Subway Fresh Fit 500) and following the race I’ll be in Victory Lane for the post race show. Kasey Kahne – like clockwork! 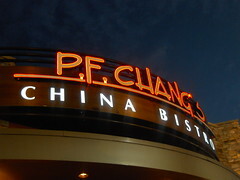 I never miss a PF Changs visit near my hotel in Peoria Thursday evening near the sports complex and neither does Kasey Kahne. When I got off the air last night I stopped by PF Changs for a late dinner and, once again, there was Kasey and a group of his buddies seated at the adjacent table. 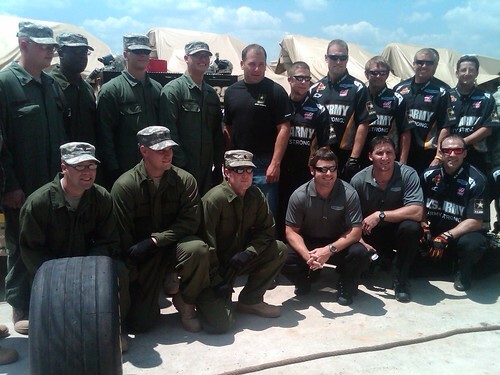 It seems every year at Phoenix when I arrive at PFC – there is Kasey. The wait staff gets pretty excited because they know he will be there. A woman at the next table with a cute little toddler kept passing Kasey things to sign – the baby’s block , the babies bottle – I was waiting for them to pass the baby over for a signature. The waiter had a sharpie ready to hand to the family while Kasey ate. The young family thanked Kasey and then exited with a baby bag full of signed merchandise. Kasey, who is always great with signing for fans, was extremely accommodating, as always. Kahne is currently 10th in the NASCAR Sprint Cup Series driver points standings, 112 points behind fifth place Tony Stewart. He’s got an average start of 12th and an average finish of 21st here at PIR. Tonight (Friday night) Kahne will be on hand for the “Grand Opening” of PIR’s New Budweiser ROLL-BAR. Tickets to the Budweiser ROLL-BAR can be purchased on line at http://www.phoenixraceway.com or on the phone at 1-866.408.RACE). Matt Kennseth – Doesn’t think anyone knows for sure the status of McMurray team – assumes the out team will move across the street to Yates. I have to get out in the garage I’ll have more for you later.